Amherst College operated a small rope tow ski area on Memorial Hill in Amherst from the 1950's to the early 1970's. The vertical was only about 60'. The area closed around 1973 due to vandalism. As of 2007, the area is off limits for any winter sports due to liability issues. To the right is a Terraserver shot of the site of the ski hill, basically an open field. 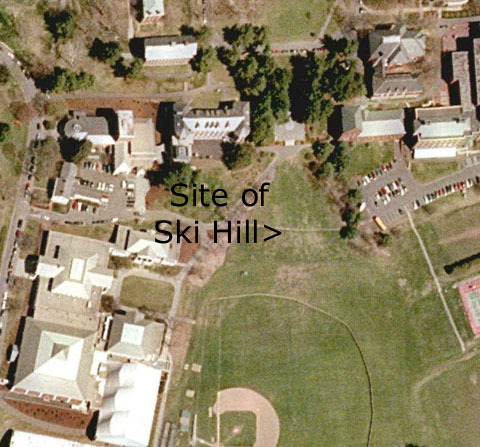 Ken Cuddeback: Another ski hill that was used by Amherst College is Memorial Hill, located right on the main campus in Amherst, Massachusetts. I can remember a rope tow on this hill for skiers. This would have been in the 50's and 60's as I was quite young at the time. The hill today is a favorite sliding spot and looks out to the Mt. Holyoke range. Perhaps other people can add some history on this site. Peter Collery: Amherst College used to have a rope tow which, I think, ran up the right side (looking up from the bottom) of Memorial Hill on campus. IIRC, the left side of the hill was ungroomed and got quite bumpy. The college ski team would practice there. The lift closed in the winter of 1973-74, or maybe ‘72-‘73 after being vandalized. Times having changed, I think we’ll never see its likes again.